Can anyone with experience in this topic enlighten me on the current Australian standard before I request the spec for the machines. 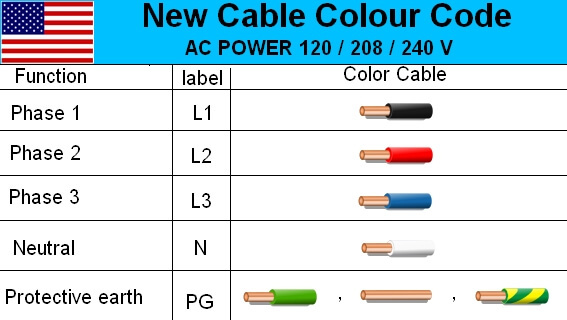 For example, any three-core (3C+E) or four-core (4C+E) power cable bought in Australia would follow the above colour codes. These colours are strongly advised, but not mandatory. 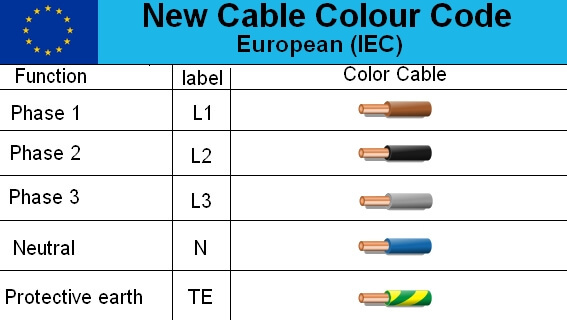 The internal wiring of equipment may come with European colour codes (brown, gray, black, blue) - this is permissible by AS 3000. The wiring may also come with no colour code at all. For example, all the wiring might be gray, with wires identified by numbers or labels - this is also permissible by AS 3000. German equipment, in particular, often comes like this - a baffling collection of gray spaghetti. Therefore, writing a specification that "all wiring colours shall comply to AS 3000" is a pretty weak specification. 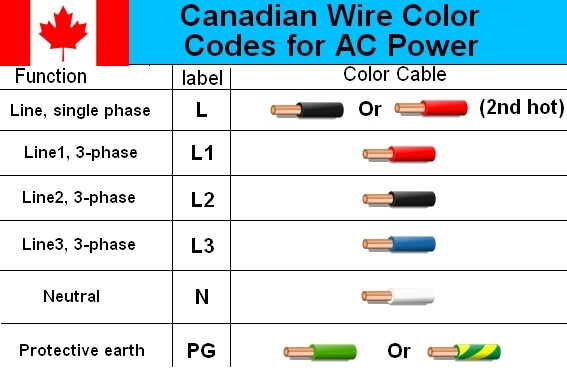 It's better to specify that three-phase power circuits shall be identified by colours, and the acceptable colours are - red, white, and dark blue for phase conductors, black for neutral, and green/yellow for earths. For single-phase wiring, I've seen both a) red active / black neutral, and b) brown active, light blue neutral (European style.) AS 3000 allows for both - so long as you don't mix the two colour schemes in the same installation. insulation, the colours specified in Table 3.4 shall be used. 1 Exceptions and special applications for colours are provided in Clause 3.8.3.
subject to particular equipment standards. (b) Red, white or dark blue for multiphase. combined within the same wiring enclosure or the same multi-core cable. distinguish it from the other conductors. 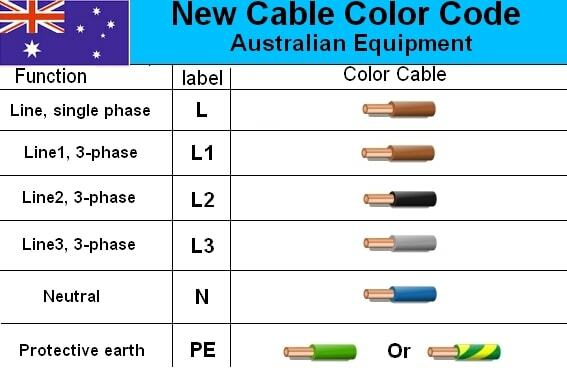 It seems these are the new colour standards for equipment, based on the most recent National Electrical Standards as of 2010 thru 2017. I have confirmed they are accurate. Based on my web research, it appears that Australia follows standard AS/NZS 3000. If you want an absolutely authoritative document, you will have to purchase the latest version of that standard, or find a place (maybe a library) where you can review it. In that standard, it is recommended that three-phase colors used in a building be red/white/dark blue. It is not required. It is just suggested. 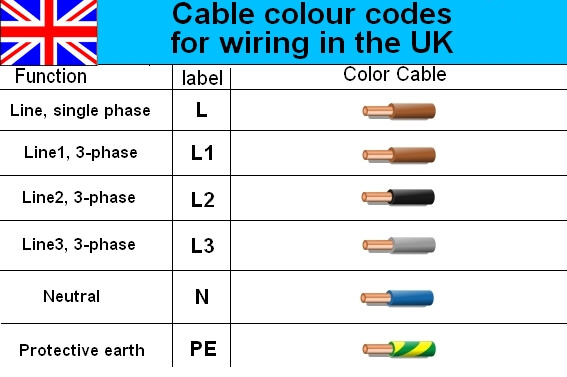 A number of colors are prohibited from being used for phase wires. Neutral can be light blue or black. But since one of the suggested phase wire colors is dark blue, it seems that black is a better choice for neutral. Ground can be green or green with yellow. However, Europe follows IEC 60446. That standard uses the grey/black/brown scheme. Apparently AS/NZS 3000 allows you to use the EU color code also. 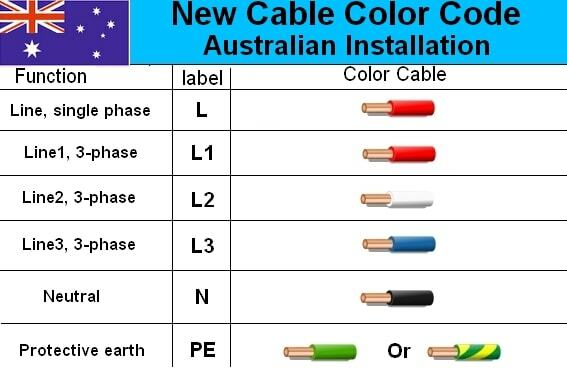 Some websites are saying that the IEC 60446 color code is actually recommended or required for EQUIPMENT sold in Australia. So I would say that if your product may be dual marketed into EU countries, you should consider using the EU color codes. Australian electricians will probably be familiar with it, and it is "legal" in Australia. But the other color code could cause problems in the EU market. Nobody has actually quoted the real 'machinery' standard for Australia which is AS60204. This standard will help you to specify what you actually want including the lamp and control button standards. AS/NZS 3000 is ONLY for fixed wiring not machines. Not the answer you're looking for? 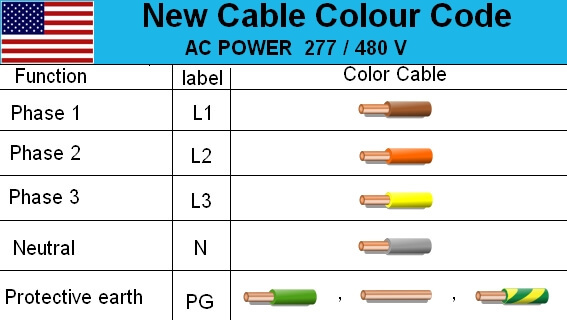 Browse other questions tagged three-phase standard colour-coding or ask your own question. Thermistors' colour coding same as the resistors'? Red for +ve, black for 0v, …which colour for -ve rail?